The first book I read this year actually covered two of my 2015 reading goals, it’s a mystery and it has a blue cover! To ease into my reading challenge, I picked up the middle grade book Who Could That Be at This Hour? by Lemony Snicket. I read most of the Series of Unfortunate Events books, so I had an idea of what to expect when I began this book. Snicket’s writing is engaging, but does tend to jump around a lot, so you have to pay attention if you don’t want to miss anything. Synopsis: Drawing on events that took place during a period of his youth spent in a fading town, far from anyone he knew or trusted, Snicket chronicles his experiences as an apprentice in an organization nobody knows about. While there, he began to ask a series of questions— wrong questions that should not have been on his mind. Who Could That Be at This Hour? 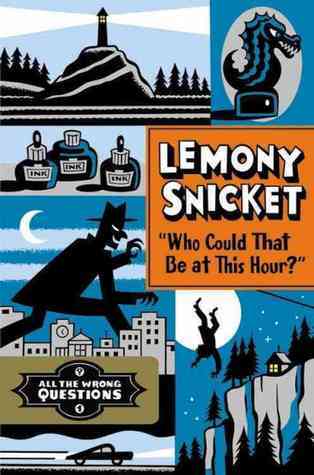 is Snicket’ s account of the first wrong question. Because this was written intentionally to be the beginning of a series, there are a lot of questions left unanswered. We don’t know anyone’s back story yet, which is extremely frustrating. I guess I’ll have to read the rest just so I can find out what motivated each of these people to become involved in such a convoluted tale.